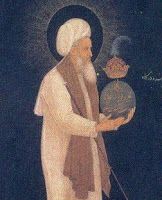 This striking quote by the Sufi Bayazid indicates that the spiritual search is comprised of two actions or journeys; the first journey being the traveler’s action toward the goal and the second that action of the goal or teaching upon the traveler: this second action being the saving Grace. Today, many western spiritual travelers are unaware that their journey is comprised of this multi-dimensional aspect. Mistakenly, some equate success only with personal effort, believing the harder he/she tries the greater their chance of enlightenment. Randomly sampling paths and exercises, going from the outer world inward, seeking to connect with their own inner, spiritual center; often this first part of the journey takes a physical form: exercises, prayers, reading books, personal discipline and doing good works. In Islamic sacred tradition we find in Hadith Qudsi, God says, "When My servant draws near to Me a handsbreadth, I draw near to him an armslength; if he draws near to Me an armslength, I draw near to him a fathom; if he approaches Me (like) walking, I approach him (like) running." In our western culture, many are still unfamiliar with the subtleties of eastern spiritual training. The traveler wishing to make the journey from form to essence, in addition to overcoming personal and societal obstacles must also come to terms with this dimensional factor: eventually realizing success is based upon a combination of organized effort and Divine Love, and Love is bestowed not earned. In this writing, we will continue to discuss some key elements of the spiritual journey and further prepare the ground work for personal realization of the Beloved’s timeless caress. Nowadays, when the traveler goes into any large bookstore one of the things which becomes apparent is that there is a surplus of people writing about their own spiritual experience and how to travel inward. It seems just about everyone has a book, personal method, and set of exercises to complete the journey; for the most part, in good faith, these authors wish to share a blueprint that has worked for them. Within every one, there is an empty space which often manifests as a hunger or unease. On some level, each of us feels there is a missing piece and we all go about our lives trying to fill it. Loss of the Sacred & Mythical: To further heighten the need for the spiritual journey, many of our more traditional connections with the sacred are no longer available. Today we are a scientific culture and daily, science challenges many of our old myths and traditional spiritual teachings. For example, the Bible offers that humanity has existed on earth for something like 10,000 years; whereas, science suggests that we have been on this planet, in human form, for millions. Similarly science suggests there were multiple locations where humanity began, not just one location or Garden of Eden. Each civilization requires practical wisdom, a mythos or set of rules to help the traveler grow and guide their life; rites of passage, which traditionally helped connect the traveler with the Universal Divine through their own sacred center, in our culture have been replaced with consumerism. For western travelers, science, money, need for power, credit cards and individual personal expression have become the center of life. While these aspects to life are important, they do not fill the empty place and the inner hunger continues. Some travelers quickly recognize the malaise as a spiritual hunger. These travelers read the books, follow the exercises and prepare for the inner experience which connects with the Divine. Books, lectures, videos, articles, are part of the answer; however, the inner fire must be tended by something else as well. All of us are spiritual beings who have taken on a physical body, with a spiritual center that knows the way home. This spiritual center, or heart, is always connected to the sacred. The traveler must learn to still that part which is tied to the world and listen to that which is tuned to the Higher. This is termed ‘remembering.’ This connection is enhanced as the traveler learns in the presence of a teaching Master. Often, this learning facilitates the second dimension to the journey. Preparation for Study: Connecting with your own inner current is part of being human. It is as natural as breathing or drinking a glass of water, yet, most often we are blocked from this experience by daily cares. Also, it is natural to fill the empty space with concerns, ideas and worry, yet we must also set aside time to allow what is inside to naturally come forward. To reach our sacred place and allow this energy to manifest on a conscious level, we must prepare, develop the skills necessary and be in contact with a teacher. The second journey, connecting with your own inner current and allowing it to come forward, daily, is a matter of right time, right place, and right people working together. Finding the Teacher: In order for the traveler to be taught how to efficiently go inward, as well as allow what is inward to come forward and manifest, they must be part of a mystical school or path that specializes in this preparation. The traveler must be in an environment where this type of experience is offered and when ready, bestowed by the Divine upon the traveler. Traveling the Path: Each of the great religions has an inner current or mystical tradition; yet this type of experience is not for everyone all the time. As indicated above, it requires preparation and a teacher or environment which specializes in this learning. To stimulate spiritual experience before the traveler is ready, can cause more harm than good; many have become casualties of the spiritual path by opening their spiritual centers prematurely. What you must do yourself- make sure you do it. In our western culture, we are at the frontier of spiritual learning, just becoming aware of eastern paths and traditions that have long connected travelers with the Divine. Similarly, we are witnessing an explosion of new age teaching and interest in the spiritual. As well, science has joined in this search for the underlying unity or life energy in the universe. Listen to Dr. Bitkoff’s weekly show on internet radio: Practical Wisdom, Tuesday 1-2 pm. Also by Dr. Bitkoff, A Commuter’s Guide to Enlightenment, Llewellyn, 2008 and Journey of Light: Trilogy, Authorhouse, 2004; these books are available from publisher or on Amazon.com. To contact author go to www.stewartbitkoff.com.